Almost a year ago, I wrote about the use of precious metals in eighteenth-century medicine. Ever since, I have studied a lot of new primary sources and learned more about alchemy and medicine. Obviously, not everything I read will find a place in my research output such as journal articles, but sometimes I find little gems that I just want to share with a wider audience anyway. As it is the holiday season, a very brief history of potable gold seems appropriate this month. As Lawrence M. Principe describes in his excellent book on alchemy, some early modern alchemists attempted to extract a ‘tincture’ from gold that contained the colour of the metal, also called Sulphur of gold, anima auri, or the ‘soul’ of gold. Some believed that this material was potable gold, a supposedly universal panacea prepared from gold, characterized by the fact that, unlike other medicinal preparations from gold, it could not decompose back into gold. The gold had been sufficiently ‘dissected;’ only the therapeutic part was preserved. Drinkable gold did not only have therapeutic significance; its creation was also a more general chemical inquiry. 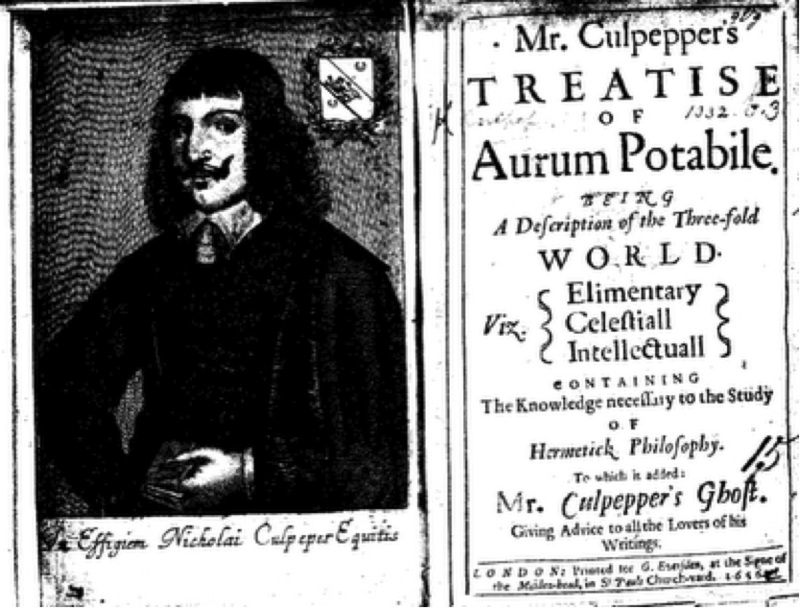 This shows from a work on aurum potabile by the famous English botanist Nicolas Culpeper (1610-1654) was posthumously published in 1656, in which the author connects the ‘elementary, celestial, and intellectual’ world. I have thought about it, whether such a primordial matter [Gur] of gold could be the true potable gold, so adorned by acclaimed forces? This is the only reason of my desire to see it: because it would be easily evaluated by cautiously applying it with the ill. Although Boerhaave was curious, you would almost hope Gur was not potable gold, as it was apparently a ‘greenish, soft, thickened material similar to butter fat.’ Boerhaave never set eyes on a sample of Gur, and died five years after he wrote his letter to Bassand. As my previous blog on precious metals in medicine demonstrated, by the late eighteenth century most medical professionals had become persuaded that precious metals or preparations thereof had no special curative powers, yet the general appeal of precious metals remains until today. 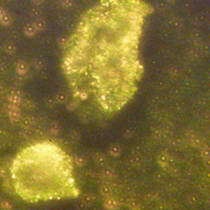 Some people believe that colloidal gold is the gold of the alchemists, and that it has health benefits. Indeed, gold nano particles appear to have some very specific medical applications, for example as a drug carrier or in tumour detection. However, there are no indications that randomly consuming colloidal gold has health benefits as far as I know. Yet even if you do not think consuming precious metals will improve your health, they do give many of us a festive feel, and if you want to, you can still drink gold, albeit in a somewhat different form than the alchemists and early eighteenth-century medical men such as Boerhaave envisioned. Today, all over Europe cinnamon-flavoured liquors with small fragments of gold leaf swirling in them are available (Gold Strike, Danziger Goldwasser, Goldschläger). 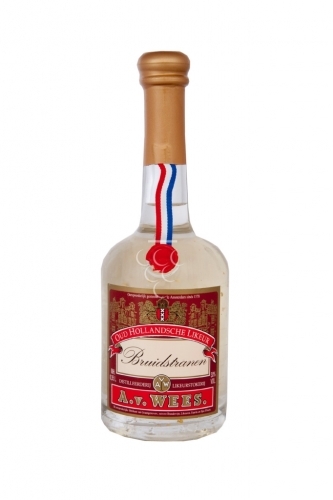 Curiously, the Dutch variety of this liquor is called ‘Bruidstranen’ (tears of the bride). It is hard to tell exactly since when this drink was produced and when the gold leaf was first added, but a search in the repository of the Digital Library of Dutch Literature (DBNL.nl) suggests the consumption of a drink called ‘Bruidstranen’ during or shortly after a wedding was a common tradition in the nineteenth century. However, it appears that these ‘Bruidstranen’ were a sort of spiced, mulled wine or liquor; also known all over Europe as a festive drink called Hippocras. The gold leaf may well be a twentieth-century addition. This shows how the concept of ‘potable gold’ has changed profoundly in less than three hundred years; another reminder of how careful we should be when studying historical objects and concepts, as it is really easy to misinterpret them. Yet if you want serve your guests a festive cocktail and a good story this New Year’s Eve, mix a little layer of Gold Strike or Bruidstranen with cava, prosecco or another bubbly white wine in champagne glasses, and tell them about the potable gold of the alchemists and the tears of brides. P.S. For those who read Dutch: the Dutch medical heritage website http://www.medischerfgoed.nl is completely renewed. Check it out! Principe, Lawrence M. The Secrets of Alchemy. Chicago: University of Chicago Press, 2012, 113. For more about the eighteenth-century search for Gur, see Alfonso-Goldfarb, Ana Maria, en Marcia H.M. Ferraz. “Gur, Ghur, Guhr or Bur? The quest for a metalliferous prime matter in early modern times.” British Journal for the History of Science 46, nr. 1 (maart 2013): 23–37. Some people do still think a gold solution will improve their health, for them, gold colloid is sold online: http://www.crucible.org/gold_colloids.htm.